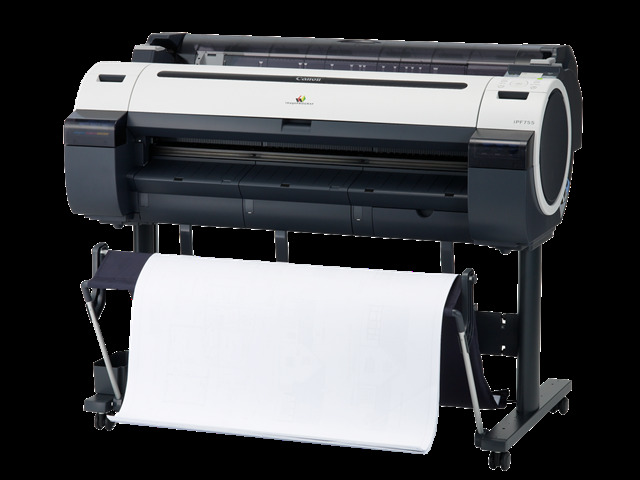 The Canon imagePROGRAF iPF755 is a large format printer designed to produce extremely large documents - as wide as 36" - at high resolutions and at high quality in both black and white and in color aimed at a professional market, intended for engineering and architecture jobs more than anything else. The imagePROGRAF iPF755 produces documents at a maximum resolution of 2400 by 1200 dpi. It supports media widths between 8" and 36" for cut sheets and 10" to 36" for roll feeds. It can process rolls as long as 59' printing to a roll feed and 63' for a cut sheet, and a maximum media diameter of 5.9". When using the front loading manual feed, it can print to media between .07 and .8 mm thick. It can print to plain paper, glossy paper, coated paper, heavy-weight coated paper, semi-gloss photo paper, tracing paper, matte paper, glossy photo paper, heavy-weight semiglossy paper, and matte photo paper. It supports media sized A1, A0, B2, B1, and 36"-inch rolls, and paper between .003" and .031" thick. Borderless printing can be done on paper 10", 14", 17", 24", B2, A1, A0, or 36" in size. 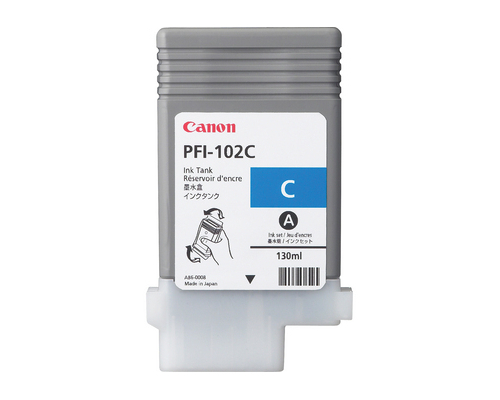 The printer has a roll-feed that can process one roll at a time through its front output. A top loading manual feed allows it to feed one sheet through a front output, and the front loading manual feed can process one sheet, printed through the front. The printer has a built-in 80GB hard drive, a feature not often included on printers like this one. It increases the speed of print jobs and offloads work that would otherwise put additional load on the computers to which it is connected. Review it: "Canon imagePROGRAF iPF755 "
The printer ships with six starter ink tanks featuring lower capacities than replacement cartridges. Consumables for this printer include five ink tanks for matte black, black, cyan, magenta, and yellow, measured at 130ml each, as well as print heads to be replaced when near clogging and a maintenance cartridge that must be replaced in order to dispose of excess waste ink. Unlike consumer printers or office printers, high-end inkjets' ink is measured solely in milliliters, as the number of pages produced varies based on the quality of prints, how large sheets are, and what colors make up an individual print. This combination of factors makes it almost impossible to accurately gauge the number of sheets produced by a single tank of ink.